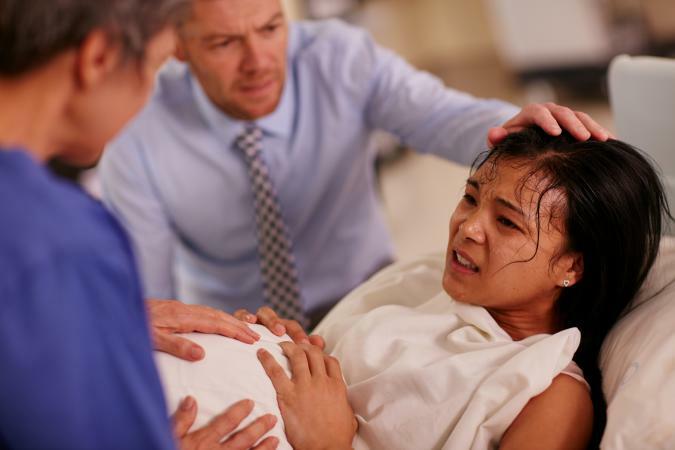 When your baby is ready to be born you will experience labor contractions. Contractions are the tightening of the uterine muscle that delivers the baby out of your body. Labor is divided into three stages, at each stage your contractions will change in length and how they feel. Complex factors trigger the onset of labor contractions. At or near term, release of oxytocin from the mother's and fetal pituitary glands are involved. The increased hormone causes contractions that tighten the uterine muscle. The frequency and strength of uterine contractions change during each stage of labor. You can time your contractions to help you determine which stage of labor you are in. To time your contractions, count from beginning of one contraction when the pain begins, through when the pain subsides, to the start of the next contraction. The amount of time between the two contractions is how far the contractions are apart. Continue to note the time from one contraction to the next to see if there is a regular pattern. As you get further along in your labor, your contractions will get more regular and closer together. At the beginning of labor, the tightening or painful part of your uterine contractions will last about 30 to 60 seconds. Near the end, the pain will last longer. Record the timing of your contractions on a notepad. Call your doctor when your contractions begin to be regular. He will advise you when to go to the hospital based on your information. Labor contractions change during each of the three stages of labor. As the first stage progresses, you may feel like a rubber band is tightening and releasing at intervals around your abdomen and lower back. During the tightening part of the contraction, your abdomen will feel hard to the touch. Your contractions might be very irregular at first. Begin timing them to see how far apart they are. One contraction may be 20 minutes apart from the next, or as close as 5 minutes. You may be hooked up to a contraction monitor. The electronic device times your contractions and shows a graph of the intensity of each contraction as well as monitors your baby's heartbeat. You will see the graph peak during the most intense portion of each contraction. Your contractions occur about three to four minutes apart and become more regular and stronger, and more painful. For the duration of the first stage, your contractions will stay about the same intensity and length. The contractions in the first stage of labor dilate your cervix and moves your baby down your birth canal. This stage ends when cervix is fully dilated and you are ready to push your baby out. Your contractions are predictable and intense. With each contraction you will feel an urge to push or bear down so your baby will continue down and out the birth canal. Your nurse or your partner can monitor your contractions and help you get into position for each push. You can stop pushing and relax between contractions. Once your baby is born, your uterine contractions are much milder during stage three of your labor. These contractions help to deliver the placenta and completes the process of your labor and delivery. Braxton Hicks contractions are often felt during the second and third trimesters of pregnancy. It is most common in women who have already given birth at least once before. Braxton Hicks are small contractions that are completely normal and are considered false labor. They also might be mistaken for mild, irregular, infrequent early labor contractions. Regular, effective uterine contractions are the hallmark of labor and delivery. They are painful but necessary for the vaginal birth of your baby.